The AS-5000 combines with the DS-5000 digital voice recorder or other professional digital voice recorder from Olympus to provide a complete, end-to-end business solution. Complete with footswitch, headset, and powerful software, the AS-5000 can easily be integrated into the workflow of any office system and significantly streamline data sharing and distribution of dictations between professionals, departments, and office locations. Special email and FTP functions enable dictation files to be automatically routed to predetermined locations or addresses upon downloading. Citrix and Terminal Service are fully supported. 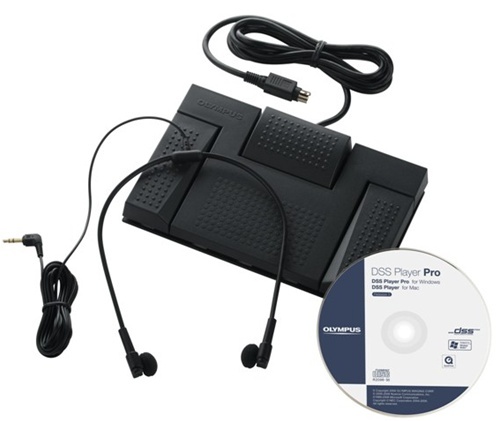 The new features, such as Audio capture function and automatic software upgrade via internet, in the new DSS Player Pro Release 5 improves the usability of the software. Multiple Format Playback : DSS, DSS Pro, WMA, MP3 and WAV/AIFF audio formats in the background when another application is running, such as a word processor. Foot Switch Control : Enables foot switch control of the playback process. Receive Dictation Files and sends documents files by Email or FTP. Sorts Received dictation files by sender and automatically sends created documents files. Manages created documents files in Association with dictation files. Search filter to the list view pane columns. Audio Capture function for the line in recording. Automatic software update through Internet. Two modes/views of operation for Transcribe bar.